SCHNECKSVILLE, PA (March 18, 2019) – The KidsPeace Board of Directors announced that Michael Slack has been named Interim President and Chief Executive Officer, effective immediately. 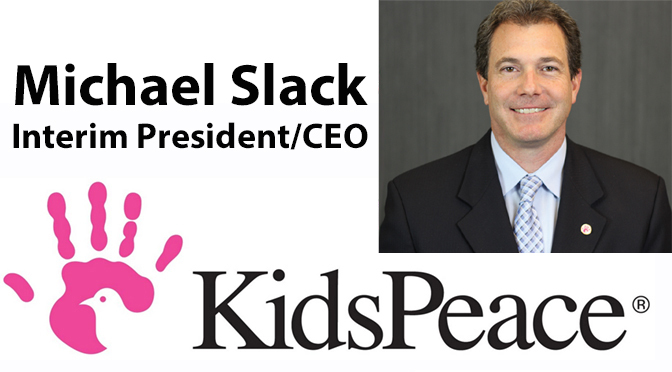 Slack succeeds William Isemann, who has served as President and CEO of the organization since 2008 and who will transition to the new role of Advisor to the KidsPeace Board of Directors. Isemann announced in April 2018 his intention to retire as CEO during 2019. Slack joined KidsPeace in 2001 as director of business development, and has served in a variety of positions in his tenure, most recently as Executive Vice President and Chief Operating Officer since 2016. In that role he has been responsible for all KidsPeace behavioral and healthcare programming and operations. Slack holds a BS/BA degree from the University of Delaware and a MBA in Health Care Administration from Temple University. He lives in Weisenberg Township, PA.